There are many scriptures that deal with conviction. We think of conviction as something bad when in actuality it’s good and it shows man his need for forgiveness. Here are 25 awesome scriptures to help you to learn more about conviction. Scripture speaks heavily on conviction. All throughout the Word, we read about examples of conviction, of individuals who, because of conviction were radically transformed. And we all have felt convicted at some points in our lives. But what exactly does it mean to be convicted and how much does it entail? Conviction is more than the mere feeling of guilt for something we have done wrong. It’s normal to feel guilty after doing something that we know we shouldn’t have done. Conviction goes above and beyond having a “feeling.” Convict in Greek is translated as elencho which means, “to convince someone of the truth; to reprove, accuse.” So we see that conviction brings out the truth; it accuses us of our wrongs and rebukes us of our sins. The Bible makes it clear that conviction comes from the Holy Spirit. A good preacher wants said, “as believers we should be professional repenters.” The Lord is continually refining us and tugging on our hearts. Pray that the Holy Spirit shows you areas in your life He finds displeasing. Allow the Holy Spirit to guide you so that you can have a clear conscience before the Lord. But conviction doesn’t do us any good if we ignore it and do nothing about it. 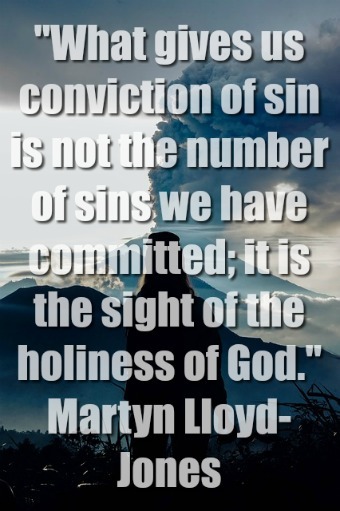 We must repent and sin no more! Jesus left His Holy Spirit with us to be our guide. He guides us through conviction which leads to repentance. There can be no reconciliation without repentance and there’s no repentance without conviction. 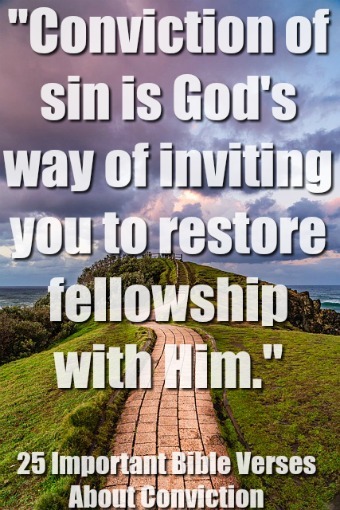 Repentance is not just confessing our sin, but also turning away from that sin. The Holy Spirit exposes the evil of our sins. So conviction is good! It saves our souls on a daily basis, it steers us in the right direction. Conviction teaches us the heart and mind of Christ and makes us right with Him! Because of conviction, we are conformed into the image of God through repentance and obedience. If you pray, pray for conviction! In order to repent, we must first be broken up for our sins. A deep inner sorrow for the offenses committed against God-this is what we must endure to get right with the Most High. If you’ve ever felt this gut-wrenching anguish, anxiety, and desperation for all of your wrongs, knowing that sin has separated you from God, then you have experienced the conviction of the Holy Spirit. 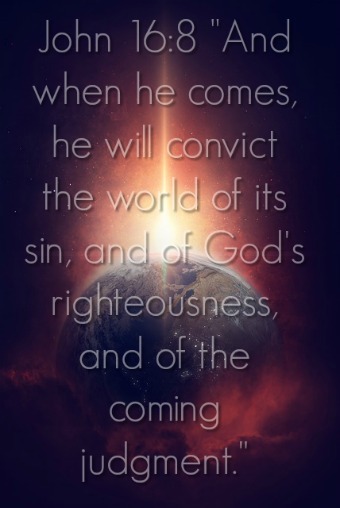 We need this Godly sorrow because it produces true repentance which without, we could never be right with God. The beautiful thing about the brokenness conceived from conviction is that it restores our relationship with God and the joy of our salvation. He heals the wounds left by our sins. We are reconciled with our Father and this brings us joy and peace that surpasses all understanding. Conviction is God’s way of gathering us back to Him because of His great love for us. Writing this post on conviction has reminded me of the story of Zacchaeus and the prodigal son. These two stories are great examples of conviction at work in the hearts of unbelievers and backsliding Christians. Zacchaeus was a wealthy tax collector known for cheating and stealing from the people. For this reason, he was not well-liked. One day, as Jesus was preaching, Zacchaeus climbed a tree in order to see and listen to Jesus. When Jesus saw him, He told Zacchaeus that He would dine with him. But the Lord already perceived his heart. Zacchaeus had a spiritual encounter with conviction and as a result, decided to return the money he had stolen and went a step further by returning four times the amount he had stolen from each person. He was saved and became part of God’s family. His life was radically changed! The prodigal son, after wasting his inheritance returned home because of the conviction and realization of his sins. The consequences of his foolishness convicted him of all the wrong he had done to his soul and his family. In the same way, we backslide every day, but the Father is always there to bring us back, whatever it may take. As we have seen through the verses we have discussed, conviction is good! Brokenness is good, it draws us closer to God. If you find yourself in deep conviction for something, don’t ignore it! Go to your prayer closet and get right with God today. Today is your day of reconciliation. Our Lord wants to be with You, He wants to manifest Himself through you and He cannot do that if you’re not right with Him. Yes, brokenness is painful, but it’s necessary and it is beautiful. Thank God for conviction! There is a clear difference between conviction and condemnation. Conviction comes from the Lord and it leads to life and joy. However, condemnation comes from Satan and it leads to despair. Conviction is intended to lead us to the Lord, but condemnation drives us away from Him. Condemnation causes us to look to self. Conviction causes us to look to Christ. When someone is experiencing condemnation, there is no solution to their problem. When we are experiencing the conviction of the Lord it is meant to draw us to Him to receive His love, grace, and forgiveness. In conviction there is hope because on the cross Jesus Christ died for our all of our sins. When we look to the cross we find freedom and hope! 24. John 12:47 For God did not send his Son into the world to condemn the world, but to save the world through him.